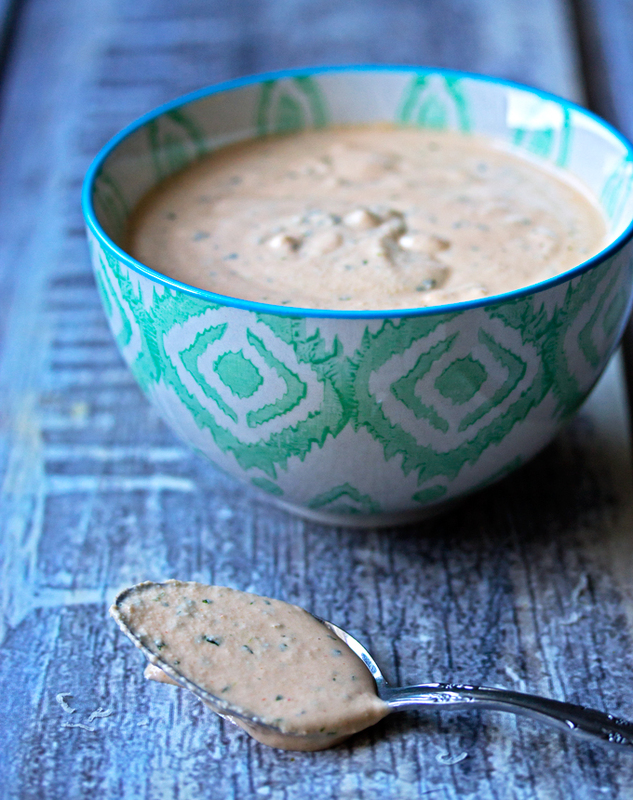 Have you tried Cashew Sauce yet? If you haven’t and you are vegan, health conscious, or you just like trying new things, you have got to try it. My first encounter with the stuff was earlier this year when I was making a birthday cake for my BFF, Liane. Every year I make her a cheesecake for her birthday. Her favorite. However, this year I knew that she had committed to completing a 21 day challenge to eat clean and workout and she wouldn’t want her customary cheesecake. Yes people, some things are more important than cheesecake! So rather than not bring her a birthday treat this year, I began a challenge of my own. To find a treat I could make for her without sugar, dairy, soy, corn, or wheat. That is when I found vegan “cheesecakes” made with cashews and coconut milk. Perfect! I was a bit skeptical at first, but once I tasted the “batter” I knew it was a winner. The cashews got so incredibly creamy and I got to thinking, what if we added savory ingredients to the cashews, made it a little thinner and more creamy. Would it work as a replacement for mayonnaise or sour cream? 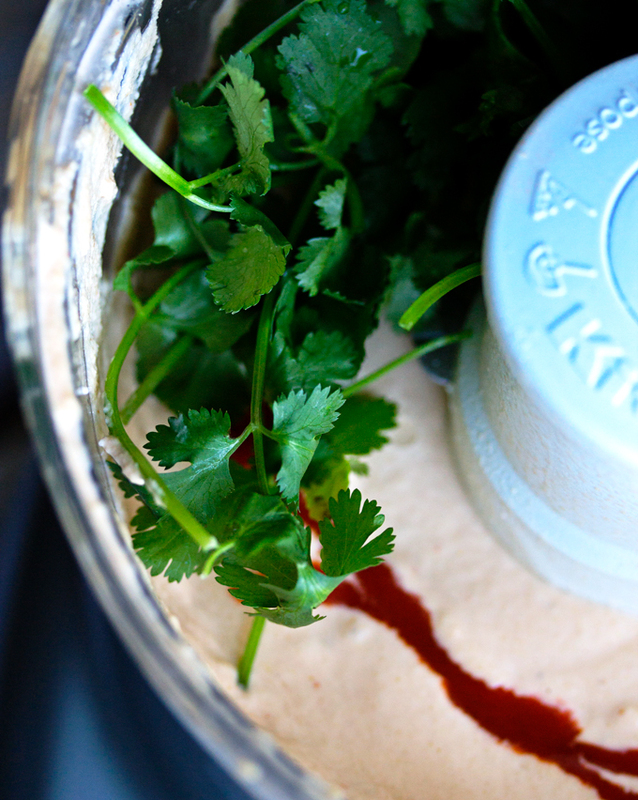 When Debbie and I made this Cashew Cream the other day, we decided to try it with lime, cilantro and a kick of spice. These are pretty typical flavors that we use when we make a sauce using mayonnaise as a base, so they were perfect for a comparison. We left our cashews to soak in water for about 4 hours, but overnight would be better. I think you could speed up this process by using hot water to soak the cashews, or by blitzing them in a food processor first and then pouring hot water on them and letting them soak for a while before straining. Maybe through cheesecloth. We both loved this sauce. It may be a bit more time consuming than pulling a jar of mayo out of the fridge, but its well worth the effort. Especially if you are trying to steer clear of dairy or unhealthy fats. I wouldn’t go so far as to say that this is a low calorie alternative, however, it is made with a healthful fat that is a much better option than dairy fat or canola oil, which is typically used in mayonnaise. Plus it tastes amazing! This sauce will undoubtedly become a staple in our fridges. I will use it in place of mayonnaise or sour cream in a variety of ways such as, a sauce for baked potatoes, a spread for sandwiches in place of mayo, in place of cream for pasta sauce, even salad dressing or potato salad dressing. 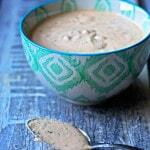 I have even seen recipes for vegan cheese sauce (think nachos, mac and cheese, quesco dip) using cashews! You are sure to see some of the best variations we find pop up here on the blog. We just can’t believe how versatile this sauce is and I cant wait to try it out in a number of different ways. So far, we have used this sauce mixed with some sundried tomatoes as a pasta sauce, and we have drizzled it on Avocado halves topped with Pineapple Prawn Salsa, which we will be posting in the very near future. (spoiler alert!) We cant wait to share that one with you either. It’s amazing! What versions of cashew cream have you tried? Or what have you tried it with? We would love to hear all your ideas! Soak your cashews in a bowl full of water. Soak them overnight if you can or at least 4 of 5 hours. 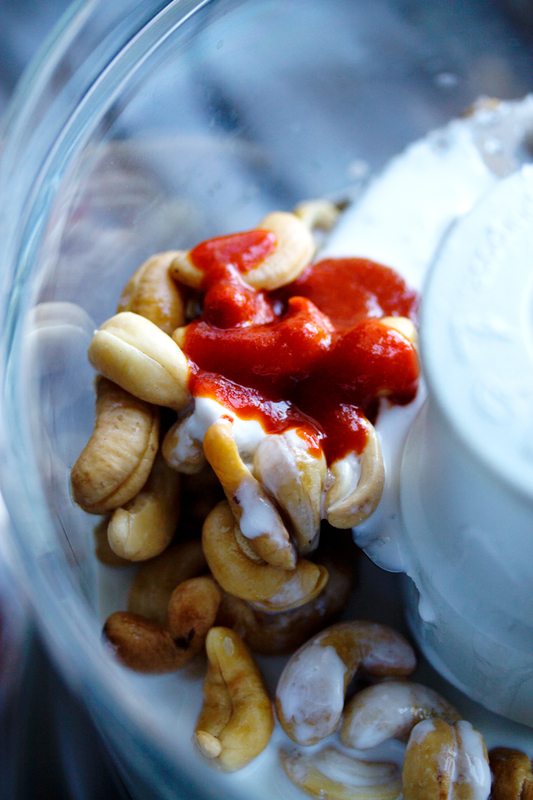 Drain the cashews and add them to a food processor. Add the rest of the ingredients to the food processor and blend it up on high speed until it gets very smooth and creamy. Adjust the seasoning. A little more salt or lime to taste. Feel free to add a little more coconut milk or water if you would like your sauce thinned out a little more. This would be great in a vegan Banh Mi instead of Veganaise and sriracha. I love cashews in sauces and dressings. Yes! Great idea! That would be very good. The vegan cheesecake you made me was delicious! I am definitely going to try out this sauce! 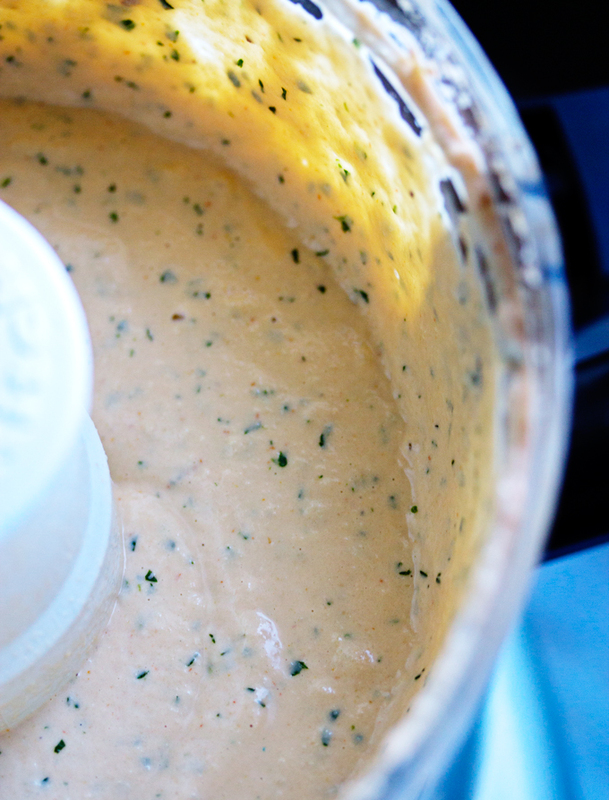 You will love this sauce Liane!